Mobile clicks accounted for 40% of all marketing email clicks in the fourth quarter of 2014, a 10% year-over-year increase, according to a recent report from Yesmail. The report was based on data from 4Q14 and 4Q13 marketing emails sent via Yesmail's campaign management platform. The researchers examined year-over-year changes for key metrics such as click-to-open rate (CTO), desktop-to-mobile purchase ratio, average order value, and conversion rate. 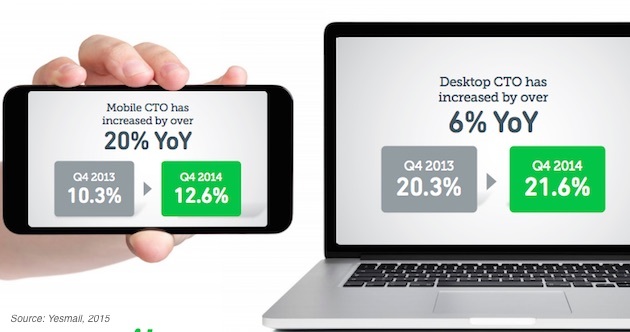 Average mobile CTO increased 20% between 4Q13 and 4Q14, and average desktop CTO increased 6%, the analysis found.